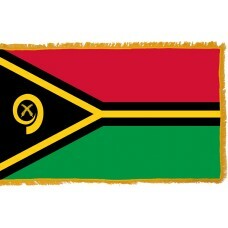 The Vanuatu flag consists of two horizontal bands in the colors of red and green. 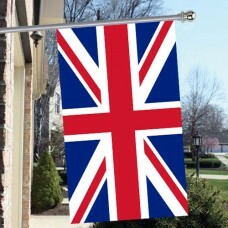 On the left-hand side of the flag is a gold horizontal "Y" which has a thick black border and the inside of the "Y" is colored in a black triangle. In the middle of the black triangle is an emblem of a boar's tusk and two "Cycad" leaves (also known as fern leaves). The red color of the Vanuatu flag represents the blood of the wild boars and of the men, the green color represents the richness and agriculture of Vanuatu's land, the black color represents the Melanesian people, the original inhabitants of the island and the gold color represents the sunshine. The boar's tusk is seen as a symbol of hope and prosperity in Vanuatu and is one by the majority of the natives as a pendant and the Cycad leaves represent peace. The Vanuatu flag was adopted on February 18th, 1990. Vanuatu is an island country in the South Pacific Ocean and is made up of 83 small islands, 65 of which are inhabited. 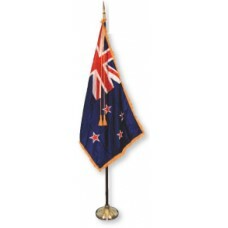 Its neighboring countries are New Caledonia, Solomon Islands, Fiji, and Tuvalu. The main islands of Vanuatu are Espiritu Santo (also the largest island), Malakula, Efate, Erromango, Ambrym, and Tanna. The largest and capital city is called Port Vila, which is located on the island of Efate. The islands were first discovered in 1606 by a Portuguese explorer called Pedro Fernandez de Quiros, who named the islands "La Austrialia del Espiritu Santo" which translates as "The Southern Land of the Holy Spirit" as the explorer thought he had arrived in Australia when he discovered them. Due to this, Europeans did not return to the islands again until 1768 when they were rediscovered by Louis de Bougainville. In 1774, Captain Cook named the islands the "New Hebrides" and they were known as this until they changed the name upon gaining independence. From 1906, the islands were controlled by the British and the French and it was called the "British-French Condominium" which was a special government. 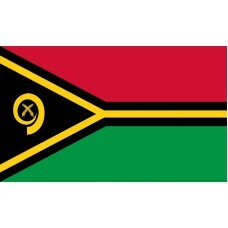 Vanuatu gained independence on July 30, 1980. The economy in Vanuatu is reliant on agriculture, tourism, financial services, and raising cattle. In recent years, tourism is becoming increasingly popular here and the main attraction that tourists visit the country to see is "Mount Yasur" which is one of the most active volcanoes in the world. Another main attraction is the "Millenium Cave" which is approximately 20m wide and 50m high and has a bamboo bridge that takes people from the cave down to the pool. The Blue holes (naturally formed swimming holes) located on the island of Espiritu Santo are also visited frequently and a popular attraction. Vanuatu is renowned for its beautiful beaches with clear waters and white sands, the most popular one being Mele Cascades, which is also considered to be one of the most photogenic beaches in the world.